Editor’s note: This article is an excerpt from The American Comic Book Chronicles: the 1970s, released August 27, 2014 by TwoMorrows. Copies are available via Amazon or via TwoMorrows’ website. One of Marvel editor-in-chief Jim Shooter’s main initiatives for 1979 was the expansion of the Marvel line into more licensed comics. In fact, nearly all of Marvel’s new-content titles for the year were based on properties that were created outside the House of Ideas. Along with the existing line of Hanna-Barbera cartoon adaptations, the Edgar Rice Burroughs comics Tarzan and John Carter, Warlord of Mars, Star Wars, Godzilla, Conan and The Human Fly, Marvel added new series based on TV series Battlestar Galactica and toy lines Micronauts, Shogun Warriors and ROM. In fact, in some months in 1979, 20% of the company’s line was licensed titles. Considering that the overwhelming success of its Star Wars adaptation kept Marvel profitable several years previously, that likely seemed a good business move by Marvel’s management. Micronauts #1 (Jan. 1979) was born from the germ of an idea from Christmas 1977. As young Adam Mantlo opened his Christmas gifts at his grandparents’ house, his father Bill Mantlo noticed the toys that received his son’s most devoted attention: a collection of figures from the Micronauts toy line. As Adam opened the boxes and started playing with his gifts, his father became inspired to write a comic book based on the toys. Mantlo arranged a meeting the following week with Shooter to push for the company to license the line. 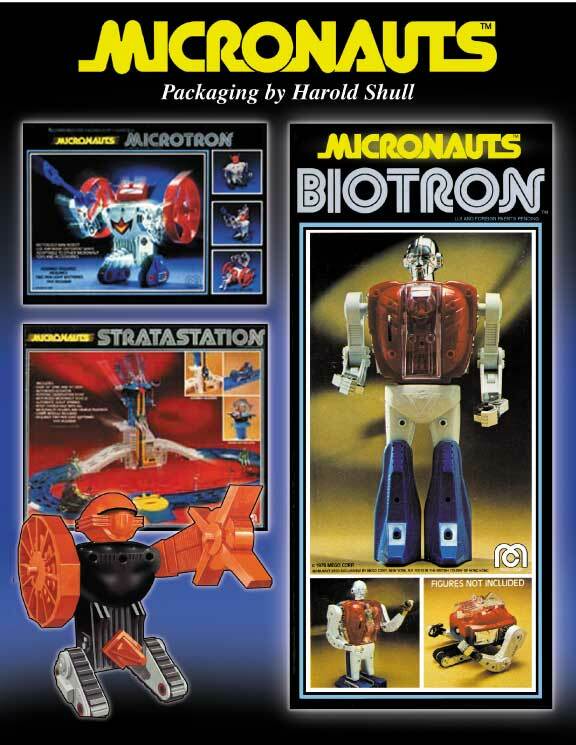 After a negotiation with manufacturer Mego and specifically with the legendary toy creator Stan Weston, the company had a license to create a Micronauts comic. Mego licensed the Micronauts toys from Japanese toymaker Takara, which had begun the line to great commercial success in 1974 as “Microman”. Mego brought the toys to America in 1976 as Micronauts (perhaps as a fun take on the idea of astronauts) and they received some popularity with American children. One of the most notable aspects of the toy line was that the parts for the characters were interchangeable; children could transfer the arms of one character onto another, and so on. Mego had licensed characters from Marvel, DC and other companies earlier in the decade for a well-remembered set of action figures in the large GI Joe style; the Micronauts were 3¾ inches tall like the contemporary Star Wars action figures – a runaway hit toy line in those years. Shooter assigned staff artist (and Broadway playwright) Bob Hall to do production art on the characters, aided by a generous collection of production art supplied by Mego. In fact, Mego sent Shooter and Hall hundreds of examples of character designs for prototypes and ideas in order to launch the comic. They also gave Marvel the freedom to pick and choose the characters that they wanted to include in Micronauts and for Mantlo and the team to create their own storylines, with barely any guidance. Thus Mantlo included some action figures, such as the mecha warrior Acroyer and the mysterious Time Traveler, in the comic without consideration of the manufacturer’s plans for them. Mantlo also changed other characters, such as the evil Baron Karza, to make them more interesting. New Marvel artist Mike Golden was assigned to draw the series. Golden had been drawing Batman stories on series such as Batman Family and Detective Comics but had grown tired of drawing super-hero adventures. Shooter offered Golden a $10 per page raise over his $28 per page rate, and the artist jumped companies without any real knowledge of what the new Micronauts series would be about. However, when he was informed it would be a science fiction comic, Golden became excited. Golden added a new character to Mantlo’s proposed cash with this own creation Bug. However, the artist rapidly became entangled in Marvel’s politics. Golden was pressured to make his unique art style, influenced by Berni Wrightson and Jim Starlin, more like that of Jack Kirby. By the fourth or fifth issue, Golden had decided to leave the book. Because his plans were made so early, Mantlo and Golden agreed that the artist would stay for the first twelve issues before departing . In fact, he had initially been announced as returning to the comic after a set of issues by Howard Chaykin following Micronauts #12 but he never drew these characters again. The team of Golden and Mantlo created a comic that was a unique combination of Star Wars, swords-and-sandals epics and super-hero action, as the Micronauts, a team of rebels, fled the strange Microverse to travel to the Earth to seek help in defeating the evil Baron Karza. The heroes land in Florida, where they enlist the help of a young boy to assist them in their mission – an ideal bit of wish fulfillment for many readers. The comic was firmly set in the Marvel Universe; it included an appearance by the Man-Thing in Micronauts #7 (July 1979). Introduced one month after the Micronauts first appeared, I brought Mattel’s set of giant robot toys to Marvel. Created by the team that had been creating Godzilla each month, writer Doug Moench and artist Herb Trimpe presented the adventures of three of the mechanical heroes from the collection: Raydeen, Combattra and Danguard Ace. The Shogun Warriors toy line consisted of more than just the three robots – in fact, the toy line included a Godzilla toy, among many other robots and monsters from diverse lines – but the two comics were forbidden from crossing over because the Godzilla contract was with Toho Studios and the Shogun Warriors license with Mattel. The comic was set in the Marvel Universe and included appearances by the Fantastic Four.